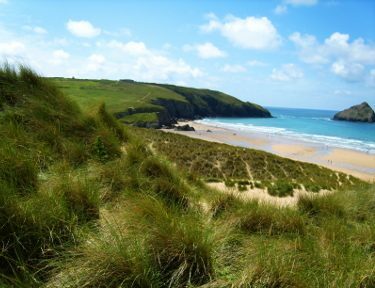 Little Molvenny is your perfect holiday cottage for walking the South West Coast footpath. Turn left and walk towards Lands End, turn right and head for Penzance & beyond. From Little Molvenny you can walk away to your heart's content on the local footpaths and country lanes, both coastal and inland. Scenic coves are close by, some with silvery sands and swimming, and others with rugged rocks and even caves to explore. While walking you can watch birds and other wildlife, or even try a guided foraging walk. 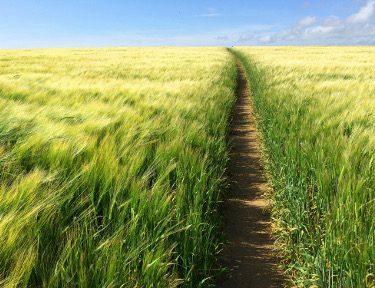 Official footpaths, which are called public rights of way in the UK, are signposted and appear on maps, and you can walk freely on them at all times, and many do. Paths may be steep or cross muddy fields or meet cows or sheep, so you do sometimes need to proceed with care and at times keep dogs on leads in fields with animals! And for longer walks, especially out of season, you may want to take your own refreshments - which of course self-catering accommodation lets you prepare to taste. 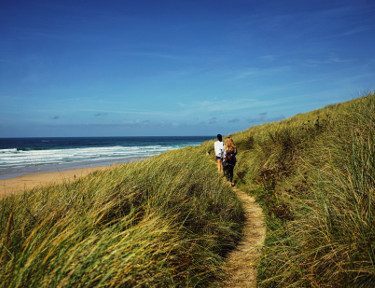 The Southwest Coast Path is the country's longest national path at over 600 miles in length, and follows the entire scenic coast of Cornwall including Porthcurno, St Ives and Newquay, making accommodation en route very popular. Older inland footpaths may not be so well maintained or visible, making for interesting exploring with the Ordnance Survey maps we keep here for you. And after your adventures you can dry your boots by the our woodburner or sun yourself on the patio at Little Molvenny! Porthcurno's main beach is about fifteen minutes away on foot, and starting at Porthcurno beach you can walk the coastal footpath westwards right to Land's End in about two hours, with excellent birdwatching spots on the way. After the Minack Theatre on the cliffs, you pass the family beach at Porthchapel and St Levan's Holy Well below the ancient St Levan church and graveyard. Going on from there you dip into the tiny fishing cove at Porthgwarra, which is often used in Poldark filming and has a charming cafe with garden in season, and a picturesque tunnel through the rock. Next is the remote and undeveloped bay at Nanjizal, which is spectacular but only has sand in some years due to winter storms. 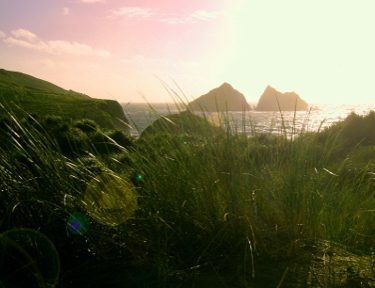 Seals like to visit this bay, wild stags are in the area, and at one end you find an open cave. 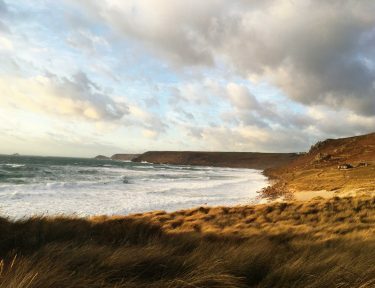 After reaching the extensive Land's End complex and its attractions you can also continue on the coastal footpath to the big surfing beach at Sennen Cove, or return home to the cottage by more inland paths or the local bus service. You'll need more than one visit to walk it all! When you walk eastwards from Porthcurno along the coastal footpath you pass remaining wartime concrete gun positions, and on your right a steep path scrambles down to the sheltered Pedn Vounder beach, much favoured by naturists. You can also venture onto the huge rock outcrop called Treen Castle, and after that a steep descent brings you to the tiny fishing cove of Penberth, which is also regularly used to film Poldark. 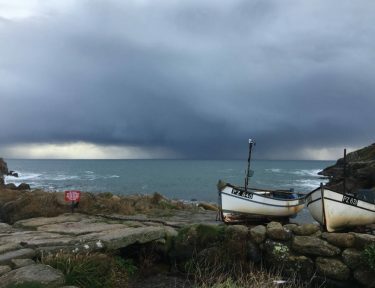 After that the path continues on to Lamorna Cove, and an ambitious walk will take you on to the quaint fishing village of Mousehole, and around Mount's Bay to Newlyn and Penzance. From Penzance the path leads onwards to the famous island of St Michael's Mount. Other popular paths in the area include the Tinners Way trail and Zennor Churchway which visit prehistoric sites between St Ives and St Just, and footpaths to local stone circles such as the Merry Maidens at Lamorna and Boscawen Un in St Buryan. Other inland paths go to the ancient villages at Carn Euny and Chysauster, and the famous Men-an-Tol rocks at Madron. Note check in/out days are usually Friday or Saturday. If you wish to take the cottage for a longer period or need to arrive on an alternative day please use the contact form to ask Nicola.